Who doesn’t want a smooth, toned, firm abdomen? There are thousands of diets, products, and workouts dedicated to helping you achieve a flat stomach, yet you are still dreaming of those healthy abs you haven’t discovered yet. Look no further; expert plastic surgeon Dr. Craig Jonov can help you achieve your goal by performing a Tummy Tuck for you in Bellevue. The stomach is an area that tends to accumulate excess fat, skin, and stretch marks over time throughout many of life’s stages. From physical growth, to weight loss, to maternity, to aging, the stomach’s appearance can change very rapidly, leaving behind sagging skin and weak muscles. In some cases, diet and exercise will never be enough to fix these problems. That’s when a Tummy Tuck, known as Abdominoplasty, is the perfect procedure to tighten the abdomen and restore your body to fitness. It is important to find the right surgeon to perform your Tummy Tuck. Your provider should be someone with plenty of experience who values safety, aesthetic quality, and the utmost patient care. Double Board-Certified surgeon Dr. Craig Jonov exhibits all of these qualities and has performed hundreds of Tummy Tucks and has perfected his technique that leaves patients ecstatic with their results. For both his male and female Bellevue patients, he tailors the procedure to each individual’s unique figure to achieve the desired results. Depending on the areas of concern, Dr. Jonov may recommend a Full Tummy Tuck, a Mini Tummy Tuck, or an Extended Tummy Tuck. Each addresses a different area of the abdomen and provides results designed with your wishes in mind. Dr. Jonov offers exceptional results and uses advanced surgical techniques to reverse the effects of heredity, maternity, or fluctuations in weight. Dr. Craig Jonov will guide you through the process and help you determine which Tummy Tuck procedure will to help you reach your ideal figure. The Classic tummy tuck, also referred to as a Full tummy tuck, will offer you a flat stomach, with truly tighter abdominal muscles beneath it. Excess fat and skin will be removed from the abdominal area, beginning near your belly button and ending in the upper torso, just beneath the breasts. The incision will be placed below your belly button, such that underwear or a bikini can always hide the horizontal scar. The Extended tummy tuck is a great choice for women in Bellevue who wish to transform a protruding abdomen and the fatty areas around it. Fat can be removed from the flanks and hips in addition to the abdomen to provide an all-around sleeker silhouette. The abdominal wall is tightened and the muscles are pulled back together. An Extended tummy tuck can be especially impactful if you have excess fat or skin on your back or hips. Addressing all of these problem areas can mean a total body transformation for you. If you do not have very much excess skin or fat throughout your abdomen, yet have some below the belly button, Dr. Jonov would recommend a Mini Tummy Tuck. This surgery addresses any “pooch” or “rolls” below your belly button and above your pubic area. The Mini is ideal for you as well if you have some excess skin in your lower abdomen that you wish to get rid of. Generally the Mini Tummy Tuck results in a smaller scar that is comparable to those from C-section births. 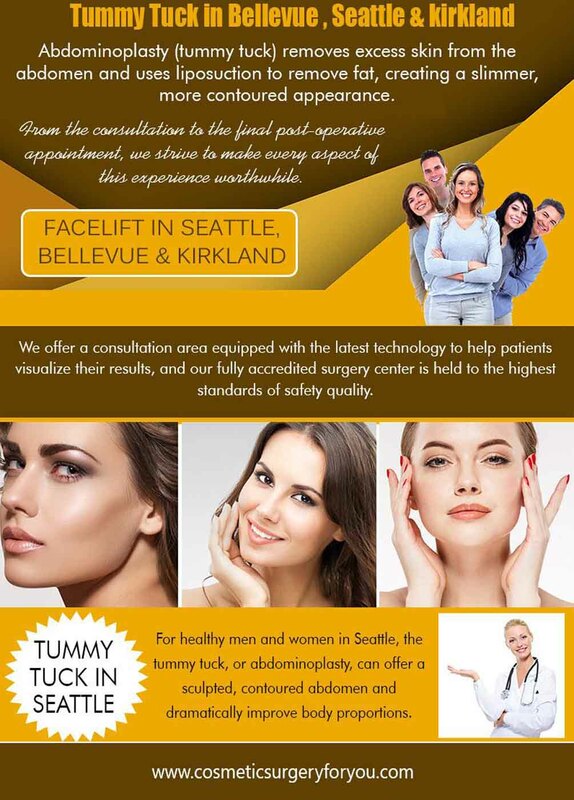 When you pursue any type of Tummy Tuck in Bellevue from an experienced, top plastic surgeon like Dr. Craig Jonov, you can achieve amazing results. At the Gallery of Cosmetic Surgery, you can schedule your consultation and rest assured that your needs and desires will be met. Dr. Jonov delivers incredible, consistent results and has a proven record of practices that demonstrate artistic ability as well as patient safety. As you can imagine, Dr. Jonov’s Bellevue patients love their results because their bodies are transformed immediately. If you have ever wished for an hourglass figure but never been able to achieve it, a Tummy Tuck may be the only procedure that can deliver the results you dream of. While the scar from a Tummy Tuck does remain visible, Dr. Craig Jonov’s results are symmetrical, intentional, and precise. He places the scar so that it can easily be concealed by your clothing and recommends a scar treatment protocol that will greatly reduce the appearance of the scar over time. If you have a scar from a past procedure or C-Section, Dr. Jonov will attempt to provide the most aesthetically pleasing result and use or remove the skin with existing scars. Abdominoplasty treats excess skin and weakened muscles. You may be wondering what options you have for the excess fat in the abdomen, hips, or flanks. Liposuction is commonly combined with Abdominoplasty to create an even more drastic transformation. Liposuction removes the fat cells beneath your skin, while Abdominoplasty tightens the muscles and removes excess skin. At the Gallery of Cosmetic Surgery, Dr. Jonov often performs these transformations and creates stunning results for his Bellevue patients. Several of Dr. Jonov’s patients from Bellevue seek a more slender figure, with healthy, tight abs. Stretch marks, sagging skin, and loose muscles may negatively be impacting your self-confidence. After all the hours you spend at the gym and in the kitchen trying to transform your own body, abdominoplasty may be the most efficient way to regain your flat abs.